I played in a fun format recently, called Weakness Cup. Only Pokémon with 5+ weaknesses were allowed in the games, along with the only held items being Weakness Policy and the type-reducing berries. This gets rid of common headaches such as random Choice Scarf Pokémon, and allows you to build a bit more consistently. While a big part of the format is guessing your opponent’s type reducing berries, it’s not an overwhelming chore. 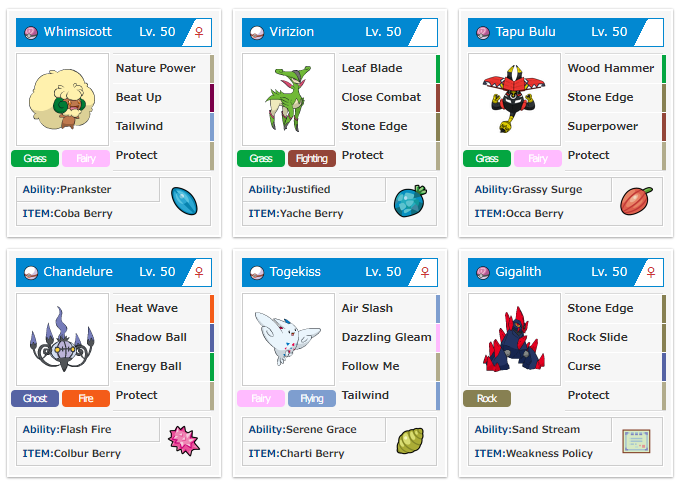 I built this team on one pure principle “Create a team that spams Grass moves in Grassy Terrain”. Skip to near the end if you want to watch some battles I recorded, if you’re more interested in the team, keep reading! Whimsicott serves three roles on this team. It has priority with Nature Power so it gets free Energy Ball off before your opponent can move. It uses Beat Up under Tailwind to boost your Virizion’s attack stat to sky-high levels. And lastly, it uses Tailwind to give you an overall advantage in most matchups. I did the EVs how I did because I wanted it to do as much damage as possible and get Knock Outs on Terrakion, Mamoswine, and Greninja. It is useful to note that in order to hit Greninja, it has to not be Dark-type, so it has to use another non-Dark move before hitting it with Nature Power. Virizion is the poor-man’s Terrakion, but in this format having Leaf Blade to abuse Grassy Terrain is amazing. You still get most of the KO’s that Terrakion would with this Pokémon, but you get a free Grass type STAB attack. Being the only Terrain setter in the format, Tapu Bulu can set up its Grassy Terrain without any opposition. The moveset is sort of unique, and as of 41 battles, I used Superpower once to Knock Out an Abomasnow. Chandelure is here just to mainly be my anti-Chandelure Pokemon. Next to Togekiss, it forms a formidable defense that can only really be beaten by Weavile and Rock Slide. The attacks are what I considered as the best options on Chandelure, and I would consider Trick Room over Protect if I had to do it again. Togekiss was here to support both Chandelure and Gigalith because most of the threats to those two Pokemon are single-target and Follow Me deals with that well. I don’t usually like Protect on Togekiss because I feel it should be attacking every turn, so I just threw Dazzling Gleam on and it’s been good for helping Chandelure take down Latias and Latios. Gigalith is here for those teams that are extremely Rock-weak and for obvious Trick Room teams. That’s really it. Weakness Policy made sense because really nothing should be OHKO’ing this Pokémon barring a Critical Hit, so just one Curse is usually all I needed to boost to a respectable level. Greninja has a wide array of coverage options and has to be respected in all sets. Whimsicott has access to priority Nature Power and Tailwind, and Aerodactyl having Sky Drop and Tailwind is amazing. Terrakion is here because it gets access to Poison Jab to KO Tapu Bulu and can be abused with Whimsicott + Rock Slide. Togekiss is able to shut down side Beat Up strats with Follow Me, and has a huge luck factor to bring things in your favor. 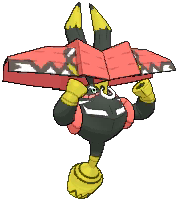 Tapu Bulu is the only terrain and aside from having issues with a lot of things, it can be supported easily. Weavile is here because it’s 1 of 2 viable Fake Out users in the format. (Sneasel being the other) and putting it next to Greninja or Aerodactyl is huge. Gigalith and Tyranitar are here mainly because they have access to boosting moves and Rock Slide. Virizion is here because it doesn’t get Rock Slide but has arguably better typing than Terrakion. Latias is here because it has great bulk and can abuse Weakness Policy really well. Chandelure is here because it has issues with a lot of the stuff above but Ghost/Fire typing is great. Latios is here because it has less bulk than Latias and just does the same job a little worse. Dhelmise is here mainly because lots of stuff in the format just can’t hit it, but it has abusable weaknesses. Abomasnow is here because it can be paired with Greninja for double Blizzard spam without much other weather. It is frail though, so it is low on the tier list. Ribombee is here because its defense is too weak to make much of an impact, but it has access to a really great Moonblast. Breloom is here because it’s overall just a worse Virizion and has issues with speed if your opponent has speed control. But it has Spore, so it gets a spot here. Slowbro/Slowking are here as Trick Room setters mainly. They need proper berries to work well, but they want Kasib (Ghost), Colbur (Dark), AND Rindo (Grass). Lycanroc is here because it is abusable with Gigalith or Tyranitar but in the end you’re just throwing more Rock Slide out and that doesn’t get you far against Grass Spam teams. Yanmega is here because although it has great STABs, it still loses to Rock Slide, and it has to play really linearly with Speed Boost. Guzzlord is here just because @ellehazy is cool tbh. It deals well with Trick Room modes, too. In the end of the tournament, I went 35–6 and finished 1812. I peaked at 28–2 and 1832, but I decided to keep playing and ended up losing a bit more than I wanted to. All in all, it was a fun little tournament and I’ve been seeing steady improvement of about +50 points every time I play in an international challenge type of event, so I’m starting to get excited for this next season! See you all at Worlds 2018! 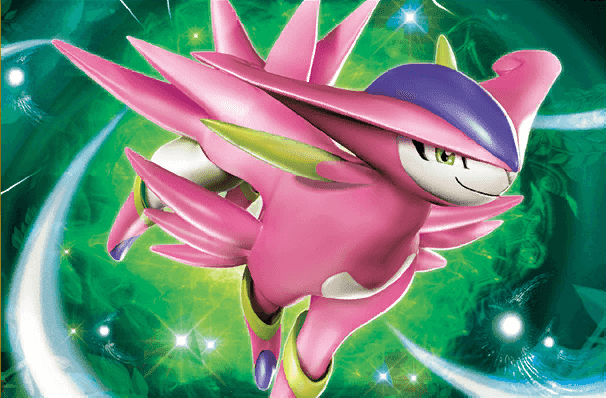 If you liked this report and want to play a format similar to this one, why not try out VGC? Check out http://www.pokemon.com/us/strategy/ for an introduction to the format. If you have any comments or want to reminisce about Weakness Cup or tiny tourney with me, my Twitter is @RandomVGC feel free to hit me up!